Starting this month and each month to follow this Gal will be making a Beer Crawl recommendation. 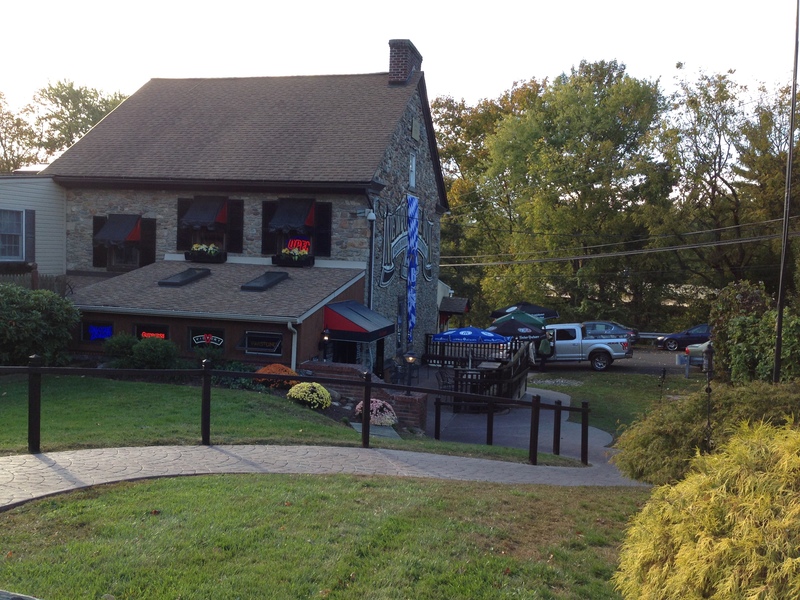 Start at Newportville Inn with a bite to eat and some fine German beer, then it’s on too one of this Gal’s favorite spots Broken Goblet Brewing were you can enjoy a variety of brews including this Gal’s favorite Ying Yang Stout, next stop Neshaminy Creek Brewing Company where you can show off your pool playing skills while kicking back with a beer, then it’s on to the final stop Dog and Bull – Brew and Music House for snack, some beer and tunes. Enjoy! This Gal has been to the Newportville Inn numerous times over the years but it had been a while since my last visit and thought it time to see what’s what. Glad to say nothing much has changed. It’s still a German place through and through. 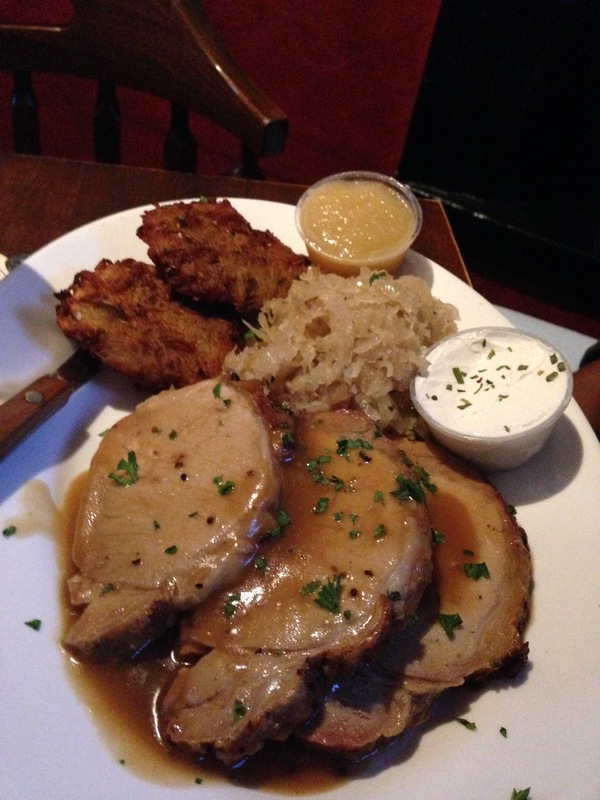 With an outside beer garden, German food and excellent selection of German beers on tap along with a few craft beers too. Oh and let’s not forget the German music playing or the complimentary pretzel nuggets accompanied by the house made mustard on each table. The mustard is wonderful and was a perfect accompaniment to the Paulaner Weiss I enjoyed. The Inn sits in a large old stone building that seems like it was once someone’s homestead and has that wonderful old world feel to it. You first step into an enclosed porch area that now serves as the waiting area on crowded nights and I believe it’s safe to say they utilize this spot quiet often. From the porch you walk into the bar area. 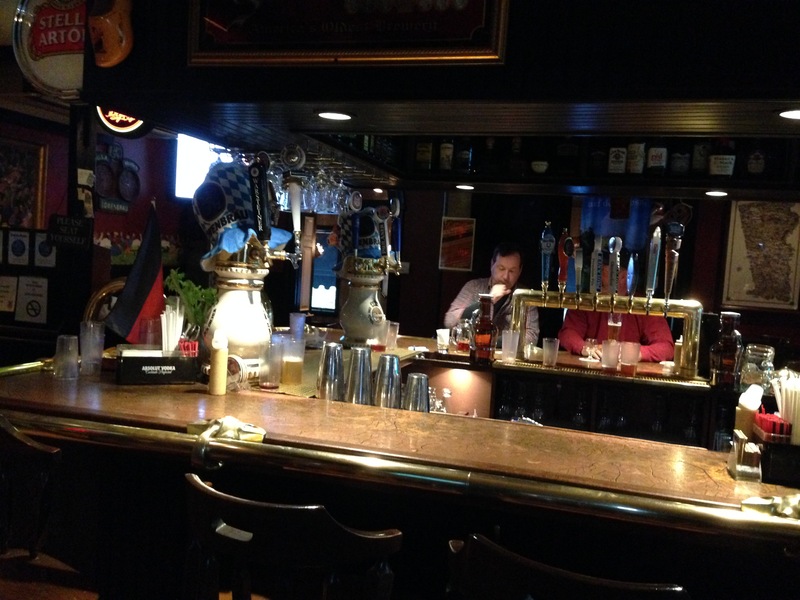 The bar itself is a good size and sits in the middle of the room with fireplaces and tables on either side. The room is very dark and cozy to begin with add in lit fireplaces in the winter time and you have a perfect spot to sit back, relax and stay warm. There’s a long porch/dining area on the other side of the bar and another dining room across from the bar as well. The Inn can hold a lot of folks but because of the lay out is able to maintain a warm personable feel. The one drawback is parking. Even on not so crowded nights parking can be a bit of a challenge but don’t let this sway you from visiting Newportville Inn. The German beer selection alone is worth a visit with 17 German beers on tap plus a hard cider if that’s your thing and the beer is dispensed via ceramic German beer towers. Keeping in mind this is a German establishment the menu is heavy on German selections but does offer a few vegetarian options as well. My companion and I decided to go full German on this particular evening with both beer and food. 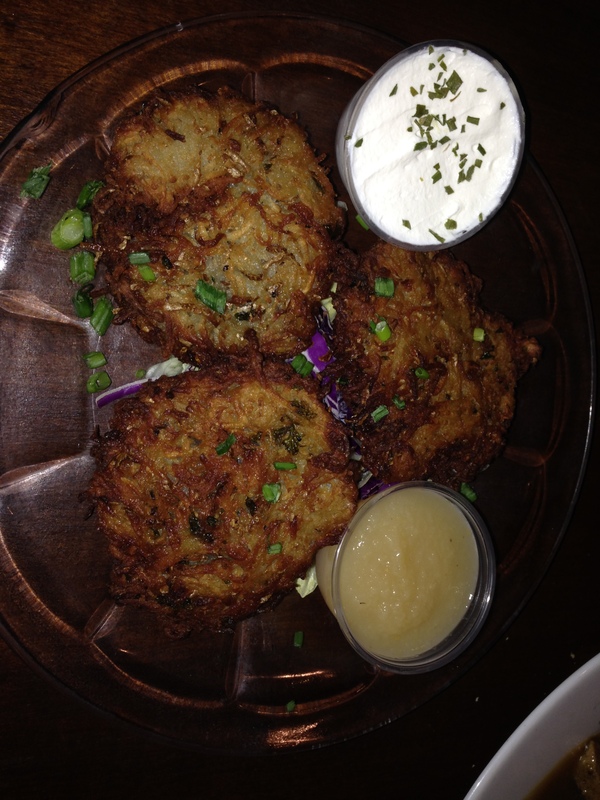 Food: Turtle soup, pierogies, potato pancakes and Schweine Braten. 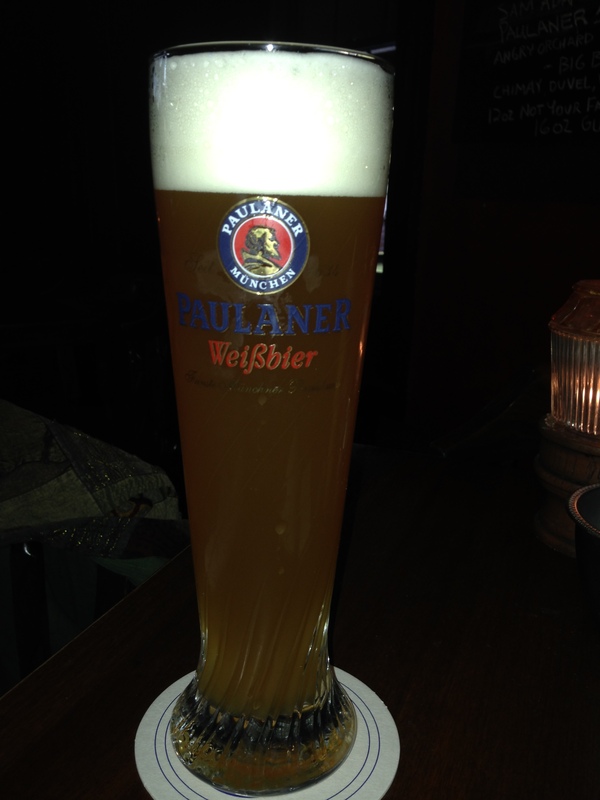 Paulaner Weiss 5.5% – crisp and refreshing with hints of orange to accent the wheat. 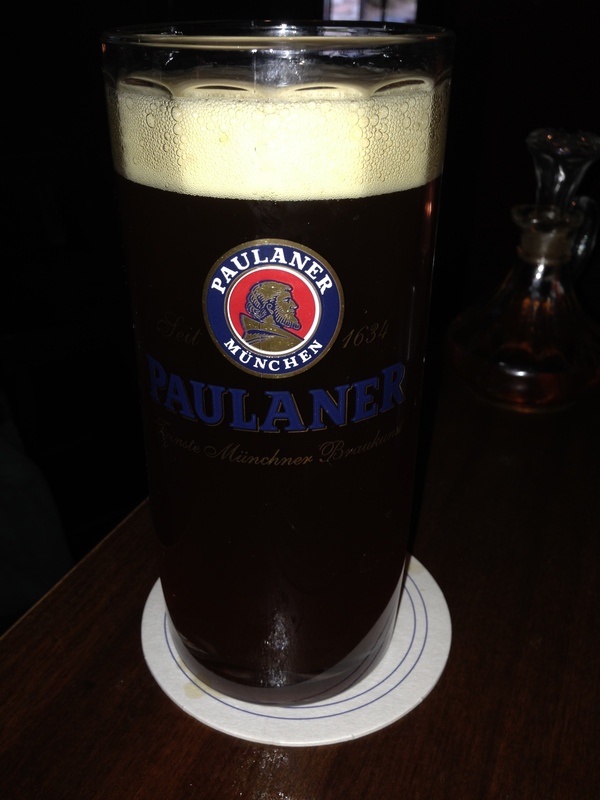 Paulaner Salvator Doppel Bock 7.9% – Yes, yes, yes! There’s a reason this Gal named one of her cats after this beer – Salvator – because it’s an amazing! Truly a favorite that I rarely see on tap. I love the combo of caramel roasted malts with hints of chocolate and hops. This beer has been brewed for over 375 years so you know their doing something right. Next time you’re in need of some time away but your wallet says otherwise spend and evening visiting Germany at the Newportville Inn. If you’re looking to make a day of it two of this Gal’s favorite breweries are just down the street from Newportville Inn – Neshaminy Creek Brewing and Broken Goblet Brewery.